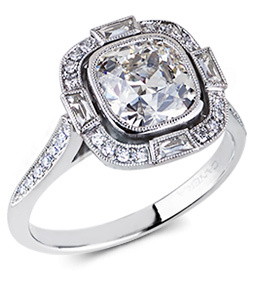 The fabrication of jewelry especially platinum jewelry has evolved very rapidly in the past few decades. The old world mentality was of a craftsman working on a single jewel, sometimes for weeks, with his passion and experience handed down to him through centuries of accumulated knowledge the ultimate goal of which was to create a jewel of quality and beauty. In the modern world, the "business" has changed into mass production being the ultimate goal. Quality, which by its nature requires time and skill has been marginalized in favor of speed, ease and quantity. This evolution and change has had a drastic and detrimental affect on the quality of the jewelry produced. Whereas jewelry created in the early 1900s and before known as estate jewelry are still being sought after by collectors and connoisseurs, modern day jewelry will have a much shorter life span and will doubtfully take on the mantle of "heirlooms" of tomorrow This "business" environment where quantity trumps quality has basically made the art of hand forging jewelry a dying one over the past few decades. The creation process of a Hand Forged ring. To understand the difference between pure hand forged jewelry against modern jewelry manufacturing, it is prudent to compare the two techniques. The vast majority of jewelry today is produced with the wax and cast method. The casting method starts with the creation of a ring in wax model. The wax is created usually by a wax carver or in the modern day with CAD\CAM machines. These waxes must be cast into metal which involves placing the wax into a container and pouring "investment" (a liquid substance which hardens after a certain amount of time around the wax), and then pouring molten metal inside the "investment" (that has hardened into the outline of the wax). Often times the first casting is with silver which allows the manufacturer to retain a replica of the wax original carving and create a rubber mold (rubber negative of the design). These rubber molds can then be injected with wax and the design can be created ad infinitum in the future. The first wax original in and of themselves dull down the precision of a design, the second wax (if used) will further dull down the precision of the design. The casting process also introduces foreign contaminants such as investment and acid into the metal. The cast jewel also has to undergo the process of cleaning by filing down and shaving off all the imperfections and roughness that casting has introduced dulling down the level of detail further. Areas which a craftsman's tools can not reach in order to clean will retain a very rough molten metal texture. To summarize, suffice it to say, that in terms of quality, cast based production is a large compromise. A Completed Hand Forged Ring. Hand Fabricating is the direct crafting on metal of a piece of jewelry and doesn't involve the use of wax, molds or casting. A design is formed in the mind of the designer, ingots of platinum or gold are melted and then pressed, bent, formed or pulled into the different parts that comprise a piece of jewelry. A ring design may have dozens of individual parts of wires, tubes or plates that are then assembled to create the finished jewel. Because the parts that comprise a jewel are created individually prior to assembly, metal surfaces of each part can be cleaned to a mirror finish. Since no casting is involved, there is no need to clean off the imperfections of casting. The finished metal will have a flawless, mirror-like finish and not be wavy caused by cleaning of the casting surface. This produces round surfaces which will be perfectly round and flat surfaces that are perfectly flat. The jewel is extremely precise due to the control a craftsman has over each individual part of a design. No areas (like the undersides baskets, cathedral openings etc.) of a jewel will have imperfections. Joints are precise, seamless, and sharp. The finished design will have the benefit of being lighter in weight than a cast design yet stronger. Porosity, visible pinpoints which are actually air bubbles inside the metal caused by casting basically don't exist in hand forged jewelry. The jewel will have higher metal density, be less porous and therefore be stronger, less likely to deform and be more scratch resistant. The owners of these works will also have the satisfaction of knowing that their jewel is truly a one of a kind creation since there are no "rubber molds" or digital files in a CAD\CAM machine to replicate the work. While the term "hand made" has become a cliche and a marketing tool, Victor Canera's hand forged jewels have the distinction of being completely "casting free". Every part, from the shank to the smallest prongs of a basket are done by hand, offering all the benefits that hand forging brings to the table. Victor Canera is proud to be able to offer a style of jewelry creation that was once reserved for the jewels of royalty to the modern, discriminating consumer and collectors alike. We are also honored to be at the fore-front of re-introducing ternms like "hand-forged" and "casting-free" into the internet jewelry consciousness. If you have any questions or concerns about the hand-forged nature of our jewelry, jewelry in general or anything else that comes to mind please Contact us or call (888)860-6430, we will be happy to assist you.